Happy All Hallows’ Day, Nexites! Hopefully your diabetic coma isn’t too severe. Otherwise you might miss out on the second part of my discussion of playing with and against Modern’s aggressive decks. Last week we dealt with the classic aggressive decks, linear aggro. Today we’ll be dealing with the less fair versions. That’s not to say that power card or gotcha! decks are inherently unfair. Many of them do follow the rules of the game enough to avoid being truly unfair, or even pseudo-fair (diet-fair? I’m still looking for a good term for “fair” decks). That said, their nature does lend itself well towards less fair Magic. I also need to stress that, despite what it may look like, none of these decks are inherently “better” than the fair linear decks. They tend to be far less reliable and much more vulnerable to hate. I liken more unfair lists as Formula 1 engines compared to fair-deck truck engines. Yes, when it gets to do its thing that F1 car is better than everything, but if anything is even slightly out of sync it does nothing. Put some fuel in the truck engine and watch it run forever. That reliability. What Makes a Power Card Deck? It’s very easy to recognize these decks. They are perfect examples of the whole being greater than the sum of its parts. I have never seen a power card deck that looked obviously good on paper. They tend to be full of very weak cards and have plenty of hands that do absolutely nothing on their own. You can be forgiven for thinking that such a deck is a terrible pile right up until it draws the missing piece and that unimpressive board suddenly kills you. Power card decks maximize the impact of their power cards to win games like a combo deck. Much like a combo deck, power card aggro is built around a large number of enablers and a small number of payoff cards. These enablers may or may not be cards in their own right, but put enough of them together and toss a payoff card in and watch the wins rack up. Affinity, Elves, and Bushwhacker Zoo are examples. Vault Skirge and Memnite are not Modern-playable on their own, but alongside Arcbound Ravager they’re a force to be feared. Mana elves are great but do nothing on their own. Mana elves plus Ezuri, Renegade Leader are a (nearly) instant kill. Goblin tokens are almost a strategy (when nobody’s expecting storm), but add a Reckless Bushwhacker to the mix and suddenly you’re dead. The strength of a power card deck is explosiveness. When you put a lot of enablers, many of which make mana, together with a big payoff card you will see ridiculous board states way too early. With a good draw, Affinity and Bushwhacker Zoo can win on turn three. These decks vomit their hands onto the board and turn that board position into victory before other decks can react. Which is also one of their great weaknesses. Power card decks have low resilience and redundancy. Shockingly, enablers alone do not win games, and payoff cards without enablers do nothing. If that initial board hemorrhage is defeated, these decks grind to a halt. Linear aggro can afford to sandbag threats just in case, but when your deck relies on quickly building an unbeatable board you really can’t hold back. Yes, holding an extra Ravager or Elvish Archdruid in hand might give you a chance if your board gets cleared, but realistically, how easy is it for you to rebuild versus just killing your opponent before the sweeper? The other big weakness is a lack of redundancy. Without those payoff cards, these decks are anemic beatdown decks at best. They must see at least one, and usually several, to have a chance of winning. Affinity fights this by having a large number of different payoffs. Elves uses Chord of Calling and Collected Company to find its payoffs. Bushwhacker tries to be play as Burn when it doesn’t “go-off.” However, there’s a reason that’s not their plan A. These decks are also very vulnerable to hate. They rely on synergy, and synergy is far easier to play specific answers to than raw power. Affinity is very vulnerable to artifact hate, while there’s no targeted hate for Jund. The most important skill in playing a power card deck is mulligan discipline. These decks have a lot of hands that look perfectly reasonable, but don’t actually do anything. A hand of two Llanowar Elves, Elvish Visionary, Dwynen’s Elite, and Heritage Druid is very explosive, but it doesn’t actually win the game. Similarly, Affinity hands without an Arcbound Ravager or Cranial Plating should be sent back. These decks are meant to explode before the opponent can react. The more time you give your opponent to react, the worse your chances of winning become. Elves’s tutors make the range of keepable hands higher but the point remains—if you fail to recognize an unkeepable hand, you will not win. Next, you need to evaluate how explosively you need to play to win. Some hands can afford to build into a big turn, while others need to be dumped before turn three to have any hope of victory. The more redundancy you have, the more time you can risk taking. Once you recognize that—sequencing! I have seen a lot of new Affinity players lose games they should have won because they did not sequence their plays correctly. Efficient goldfishing is the power card deck’s friend. I realize that I’ve been harping on how dependent these decks are on a small number of cards, and it seems like I’m building up to advising you to eliminate them but I’m not. Never try to use Cranial Extraction type effects against these decks. Yes, if you remove all the power cards from their deck they will flounder, but it won’t matter. Power card decks are too fast and explosive for you to wait around. By the time you could plausibly eliminate their key cards, you’ll be dead. The only option is to react to their explosiveness and let them collapse in the long game. It is possible, though not that likely, to race these decks. When going for their beatdown kill rather than Ezuri, Elves is a turn-four to -five deck and if you can evade their blockers you can win. Infect is frequently able to do this as well. The problem is that these decks are designed to be explosive and give the opponent as narrow a window as possible to respond, and aggressive decks aren’t well suited for the task. Realistically, you will usually take the control role against these decks. To beat power card decks, you must withstand the explosion, then win before they recover. You cannot just remove their power card(s) from play—you have to close out the game in timely fashion, especially against Elves. Targeting the power cards with spot removal isn’t enough. There’s a lot of situational awareness involved because sometimes it’s correct to target the enablers just so the opponent is slowed down and commits to the board, so that you can maximize your sweeper. If you can remove a few enablers to slow their roll by a turn and then kill the first power card, you will buy enough time to catch back up. From there, your higher individual card power or creature power will win the game. You will probably lose game one. That’s why people play explosive decks. Post-board, things get much better because the sideboard cards against these decks are much better than the sideboard cards for these decks. Think Stony Silence against Affinity and Hibernation against Elves, versus Ghirapur Aether Grid and Spellskite. The former are just more powerful than the latter. Recognize this fact and plan accordingly. As I said in my first article on Modern deck types I strongly dislike this category of decks. They are frustrating to play against and extremely fast. Most of the decks here, and the mechanics they utilize, I think are bad for Magic. However, they continue to exist so I must deal with them. Gotcha! 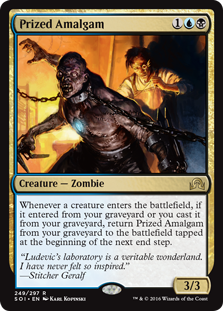 decks are built around some mechanic or card that lets them play less-than-normal Magic. As a result, they prevent the opponent from playing normal Magic. Usually this is because the normal answers and card interplay simply doesn’t work anymore. Bogles renders spot removal (mostly) dead, Infect shrinks life totals and makes it permanent, Dredge turns the graveyard into your hand. These decks demand that you interact with them along a very specific timeframe and axis or you lose. Period. I realize that many combo decks could fall under that definition. The reason they’re another category is that those decks typically look to end the game with a single massive turn using impermanent spells, whereas the gotcha! decks play cheap permanents. They’re a different playstyle—a combo deck like Storm wins by playing a lot of spells to generate a massive but temporary advantage. Gotcha! decks work either by loading up a lot of spells on a single creature or completely changing how the game is played. Simple combo decks exist within “normal” Magic. The biggest strength of gotcha! decks are its free wins. Sometimes you get those with normal decks but these decks are designed with free wins in mind. It’s why I picked the name. If you don’t have the specific interaction required, which you probably won’t, they will win. Did I mention the free wins? I feel like I really need to emphasize the free wins aspect. Beyond that, these decks typically have a respectable amount of protection for their free wins, such as Apostle’s Blessing and Blossoming Defense in Infect. This often balances their vulnerability if you actually have the needed interaction. Many also play Gitaxian Probe, meaning they know what you have and what, if anything, they need to play around. This means that these decks have a large number of obvious free wins and wins thanks to information asymmetry. They know if they can go for the win; you don’t. This tends to paralyze players and gives the gotcha! deck the initiative permanently. This is fairly important for gotcha! because they have very little redundancy or resilience. To maximize their unfair thing they frequently have to go all-in on a single threat. This is the standard modus operandi for Bogles and Infect, but Death’s Shadow Zoo often does so on a single unblocked creature. They’ll dump all their resources into one attack and ask if you’re dead. If you’re not, they’re not favorites to win. They also tend to play a relatively small number of actual threats compared to support cards, so they have to mulligan frequently and the loss of resources hurts. This also means that if you answer their initial threats they’re unlikely to see many more. Dredge is different, but Dredge doesn’t play Magic. It’s doing something else that should never have been. The other problem they have is that if you actually have the right spells they cannot win. Dredge must answer Rest in Peace or the deck ceases to function. Bogles can’t really beat Liliana of the Veil. Death’s Shadow only beats a pair of Lightning Bolts to the face when it sets up a fast namesake. That isn’t likely to be the case game one, but games two and three tend to be much worse for gotcha! decks. There’s a reason the Dredge sideboard is nothing but RiP removal. You’re almost always the aggressor—the question is how you’re doing it. Sometimes you do it by methodically drawing out answers and using your information advantage to ensure your opponent is on the back foot regardless of their board advantage, leaving them afraid of going “shields down” for fear of losing. Sometimes you’ll do it by screaming, “Blood in the water! Go, go, go!” and just trying to kill as fast as possible. Winning with these decks is very much an art based on resource management. Mulliganing is also very important here because while you need a critical mass of resources to win, you also need a threat to use them on, and you don’t have many. You have to mulligan for them, but do that too much and you’ll lack the resources to win. Very much a balancing act. Also, recognize that this deck only gets one chance to win, so don’t be too worried about fragile hands. That’s the risk you take for free wins. Or you could be Dredge and simply build a massive board without paying mana for anything. In this case you need to be looking to maximize the number of cards you can dredge in a given turn and then return your Prized Amalgams to the field. If you have the option you want to do this on your opponent’s end step so you get at least one attack in without risking sorcery-speed removal. Each non-Dredge deck in this category plays a smaller number of cheap, small creatures and a lot of ways to defend them. They’re very fast and can win from nowhere, so you can’t really race them. You have to interact, and they make this difficult by design. It is not an easy thing to do. But not impossible. Learning “Infect sequencing” is critical. What I mean is that you have to adjust how you play to account for the protection these decks play and the fact that if they use it you will die. Thus you have to force them to use resources when it is non-advantageous to do so. Use removal on your turn or after combat on their turn so they can’t use their buffs to deal extra damage. You should only try to interact during combat if you will die otherwise. If you can manage their resources well, then it is possible to retake the initiative and then the game. A card I’ve found very effective against these strategies is Blessed Alliance. These decks are very good at answering spot removal, but cannot easily deal with untargeted removal. Given their tendency to only attack with one threat and commit lots of resources to that threat, Alliance alone can be game-winning. Pro tip: there’s an opportunity to cast instants and activate abilities after combat damage before the step ends. If you kill off all but one creature thanks to blockers and aren’t dead, you can still cast Alliance and make them sacrifice their last creature. Against Dredge interaction is a losing proposition, but not a useless one. Their threats recur, so unless you can exile them (hello Anger of the Gods!) you’re never really out of danger. Instead, assuming you can’t exile their graveyard, you have to use removal to slow them down and then present a clock of your own. Dredge relies on opponents being swamped by a huge board early and it isn’t good at defending itself. If you can slow them down even a little bit and possess a decent clock you can get there. And with that, my introduction to the world of Modern aggression comes to an end. Remember, this is intended as a guide and a simplification. Every deck and matchup is far more nuanced in reality. Hopefully this will provide the overview to help you find your feet in this vast format. In my article last week I talked about players’ misconceptions about control, stemming from the prevalence of aggro in Modern. If you read this article series critically you’ve noticed all the references to the control deck I was thinking of. Join me next week when I stop the innuendo and spell out my position on control in Modern. I like this article a lot David. I want to pick your brain on one concept though–not using cranial extraction effects on gotcha decks. I agree that using the card Cranial Extraction is worthless–it’s too slow. But Surgical Extraction, in the relatively narrow class of decks that either play lots of efficient interaction or lots of targeted discard, seems like a good counterargument to the statement that the effects are bad across the board. It’s not something I would rely on. I’ve been on both sides of Surgical Extraction in creature matchups and it rarely works out. Cards that don’t affect the board against decks that flood the board are very questionable in the best circumstances. What you are essentially doing is incrementally improving your chances of winning in a longer game. Yes, sometimes you do get back some card advantage by taking an extra copy out of their hand, but more often you don’t and just improve their chance of drawing worse. Think of it like this: Lantern Control is based around making each of its opponent’s draws worse, but unless it hits Ensnaring Bridge it cannot beat a resolved creature. Anemic beatdown is still beatdown and in my experience if you’re using cards to make beatdown worse down the line without actually stopping their beatdown now, you’re falling behind. That’s why I advise against it. I’ll second that, as somebody who plays a power-card aggro deck (in my case, Assault Formation Gruul that uses Treefolk Harbinger and Permeating Mass as upside-Nacatls, and Prophetic Flamespeaker and Goldnight Castigator as finishers). Surgical Extraction on a key card can hurt- But you’re either wasting time and mana on a card that only mildly slows them, or you’re paying life against a deck that’s trying to put you to 0 ASAP. Granted, if you can force infect to play a key pump card then extract it, it’s brutal, and Extraction is AMAZING against Dredge, but it’s nada against Elves or Affinity or Boggles. Thank you both for your replies :).